"Italian Flavor...easy to prepare. We are not a fan of green beans BUT cooked this way, we are! Use fresh green beans." In a large saucepan, saute garlic in oil over medium-low heat until garlic is slightly browned. Stir in diced tomatoes and tomato sauce, cover, and cook for 30 to 45 minutes. 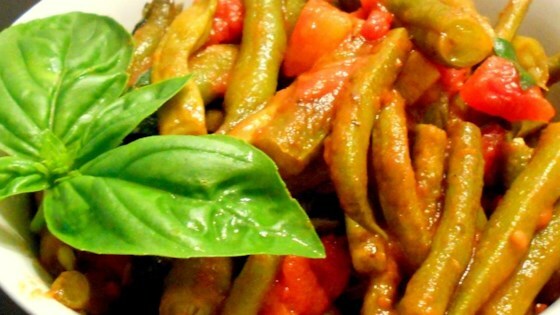 Stir green beans into tomatoes, and cook until tender. Season with salt and pepper to taste. I also don't LOVE green beans, but this recipe made me forget that. I do love tomatoes and these were delish. I only give it a 3 as hubby thought it was too tomatoey and did not like at all. We love this recipe! It has gone over very well with company too. I also tried it with zucchin and it was equally good. Fast and easy, great recipe. I don't think this one will be a fan with little kida, but as groovigryl said, her kid liked it, so I still don't know. I guess some kids like green beans, but not many...!